This 4 disc set includes 8 movies – My Friend Irma, My Friend Irma Goes West, That’s My Boy, Sailor Beware, Jumping Jacks, The Stooge, Scared Stiff, and The Caddy. A nightclub act with a handsome singer and an anarchic monkey-boy became a potent box-office force in the early 1950s. Although their wild live antics never translated intact to the screen, Dean Martin and Jerry Lewis were an instant movie hit; they had two films in the box-office top ten of 1951, and another two in the top ten of 1952. 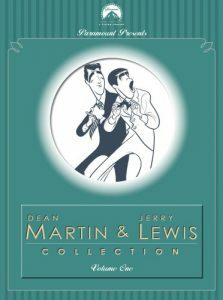 Paramount repays this effort with its Dean Martin & Jerry Lewis Collection, Volume One, which gathers most of their early efforts at the studio.Martin and Lewis were introduced in 1949’s My Friend Irma, a big-screen version of a popular radio show. The boys are in support, but their high jinks were the hit of the movie, and their portion of screen time ballooned in My Friend Irma Goes West, which they basically take over. Both movies are enjoyable comedies, and especially in the sequel Lewis’s lunatic style of mugging, vocal calisthenics, and physical shtick makes him look like an animal uncaged. Not included in this set is their first starring vehicle, At War with the Army. The next six consecutive films are here, beginning with one of their best, 1951’s That’s My Boy. Jerry plays the athletically hopeless son of a famous football hero (Eddie Mayehoff, a funny man). It’s a measure of how much Lewis had grabbed the public’s imagination that Dino doesn’t show up until the film is 20 minutes old. (Lewis later wrote that he arranged for “That’s Amore” to be included in The Caddy to bolster Martin’s popularity.) Also from 1951, Sailor Beware is a service comedy with some hilarious sequences–Lewis conducting a male chorus, for instance, or undergoing a slightly surreal medical exam–and the team still has a freshness despite the movie formula. Their timing together in the punchdrunk-boxer routine shows some of the chemistry they must have had onstage. Jumping Jacks (1952) is the least of Martin & Lewis’s service comedies, with Lewis as a showbiz performer who pretends to be in the military as a favor to Dean. The Stooge, same year, is one of their best teamings, this time with a touch of pathos along with the laughs: Martin is a self-centered singer who can’t acknowledge that his hired stooge is the reason his act is boffo. Along with the backstage stuff, the movie demonstrates how skilled Lewis’s singing was, even in a comic purpose. 1953’s Scared Stiff is a warmed-over remake of the Bob Hope comedy The Ghost Breakers, and shows that the boys were overworked; the story is lame and the clowning feels more desperate (although Lewis has a few moments imitating co-star Carmen Miranda). In The Caddy, from the same year, Martin indulges his real-life passion for golf, and Lewis plays the neglected caddy. It’s a return to form, borrowing a Stooge vibe, and boasts an odd framing story with the boys playing a nightclub act very much like Martin & Lewis.